﻿﻿Have you ever wondered who was the very first person to flick a fly west of the Mississippi? Believe it or not, it was a Mormon Pioneer, by the name of Wilford Woodruff. Before coming west, Wilford Woodruff actually served two proselyting missions for The Church of Jesus Christ of Latter Day Saints in England, where he first learned of the art of fly fishing during his second mission. Wilford Woodruff was the first fly fisher in the American West. I went fishing with Father Richard Smithies in the river ribble. He is 70 years of age & is considerd the greatest fisherman in the country. He fishes with the fly which is the greatest art in fishing ever introduced. His fish pole or rod was about 14 feet long sum thing like cane vary slender & delecate. His long fine line made of hair & cat gut was wound around a small brass wheel with a little crank to it fastend to the but end of the pole. The line then runs through half a dozen brass rings or ilet holes fastend at a sutible distance along on the rod to the small end of it. One the end of the fine fish line is fastend 5 or 6 arti-fishal flies about 2 feet apart. These are upon a small cat gut almost as small as a single hair. 25 or 30 feet of the line is unwond from the reel at the but of the rod running through the rings to the point. The line is then flung upon the water the same as though it was tied at the end of the rod & the flies with a hook concealed in each swims down the stream. The trout instantly take it considering it the natural fly. They are hooked as soon as they strike it if they are large trout & run. They of their own accord unwind as much line as they want from the reel at the but of the pole or rod. The fisherman does not pull the fish out of water on the bank by the pole but worries the fish in the water with the line untill he will not struggle. Then he draws him up to the shore by the line if he stands on the bank or to him if he stands in the water. He then takes a small hand net with a light pole 4 or 6 feet puts it under the fish & takes him vary deliberately out of the water. Father Smithies caught 7 trout & two Cheven in this way while we were with him. It was the first time I had seen the fly used in my life in the way of fishing. I was delighted with it the rod line was so light & flung with such skill & dexterity that the trout are beguiled & whare ever they are are generally taken. The fisherman has flies different for almost ever month calculated to imitate the flies that float upon the water at the time they fish. These flies are made of the feathers of birds some of various Colors. The trout will often take them before the natural fly. I was much gratifyed with this days fishing. In fact, after this experience, Woodruff was so smitten with fly fishing that he picked up his own bamboo fly rod and reel in Liverpool, England after his mission to take home to Nauvoo, Illinois. As soon as I got my breakfast I riged up my trout rod that I had brought with me from Liverpool, fixed my reel, line, & Artificial fly & went to one of the brooks close by Camp to try my luck catching trout. The man at the fort said there were but vary few trout in the streams, And a good many of the brethren were already at the creeks with their Rods & lines trying their skill baiting with fresh meat & grass hoppers, but no one seemed to ketch any. I went & flung my fly onto the [-] And it being the first time that I ever tried the Artificial fly in America, or ever saw it tried, I watched it as it floated upon the water with as much intens interest As Franklin did his kite when he tried to draw lightning from the skies. And as Franklin recieved great Joy when he saw electricity or lightning descend on his kite string in like manner was I highly gratifyed when I saw the nimble trout dart my fly hook himself & run away with the line but I soon worried him out & drew him to shore & I fished two or three hours including morning & evening & I cought twelve in all And About one half of them would weigh abought 3/4 of a pound each while All the rest of the camp did not ketch during the day 3 lbs of trout in all which was proof positive to me that the Artificial fly is far the best thing now known to fish trout with. “First Fly” by Dix Baines. This beautiful painting is used with the permission of artist Dix Baines who was commissioned to paint the story of Wilford Woodruff using the first fly in the American West. In creating this painting, Dix actually went to the historical site and had his son dress in the clothing of the time period and use a fly rod. Having been there myself, Dix captures the Black Fork of the Green River perfectly! Check out this painting and many others at Mr. Baine’s website http://dixbaines.com/artwork/giclees/. 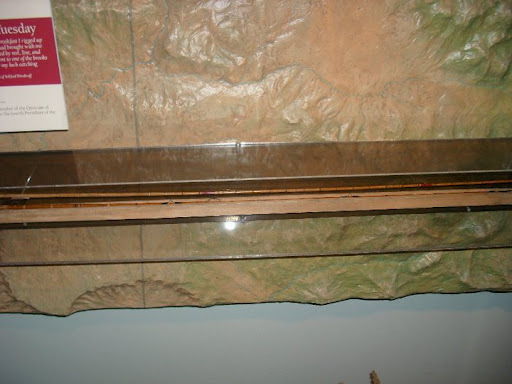 This is a photo of the bottom half of Woodruff’s fly rod, which is on display at the LDS Church’s History Museum in Salt Lake City. Unfortunately, the top section of the rod has been lost. For those who love to fly fish, Wilford Woodruff’s experience and sentiments no doubt strike a chord. He learned almost one hundred and sixty-five years ago just how great fly fishing is, especially when the fish rise to a dry fly. And he got to try it in the West before so-called progress came and spoiled it all. Now, if that doesn’t get you excited, then you need to take up a new pastime besides fishing! After this experience, Woodruff’s church and family responsiblities kept him busy so that he did not get to fish as much as he probably would have liked to. In fact, Wilford Woodruff later became the fourth Prophet of The Church of Jesus Christ of Latter Day Saints, which, I guess, is not surprising considering the fact that Jesus chose humble fishermen as his Apostles during His ministry. Indeed, fishing is good for the soul! Special thanks is given to Dix Baines for permission to use his beautiful painting, “First Fly.” This painting and many other gorgeous paintings are available for sale at Dix’s website: http://dixbaines.com/artwork/giclees/. For those who love the great outdoors, Dix really captures everything that we hold dear in nature. In particular, I love his paintings on fish and fishing. Be sure and check out Dix’s website. Previous Post CHECK OUT ANDY WAYMENT’S ARTICLE, "TEN FLIES FOR IDAHO GUYS . . . AND GALS." Next Post YOU MAY BE A DIEHARD SHARPTAIL HUNTER IF . . .
That was a cool story to read…the account of his time on the River Ribble. I got a kick out of the 'brass wheel with a small handle'.Great stuff!